Verstappen takes the flag for his first F3 win. © FIA. Young Dutch racer Max Verstappen took his maiden FIA European F3 win of the season at the Hockenheimring this afternoon. 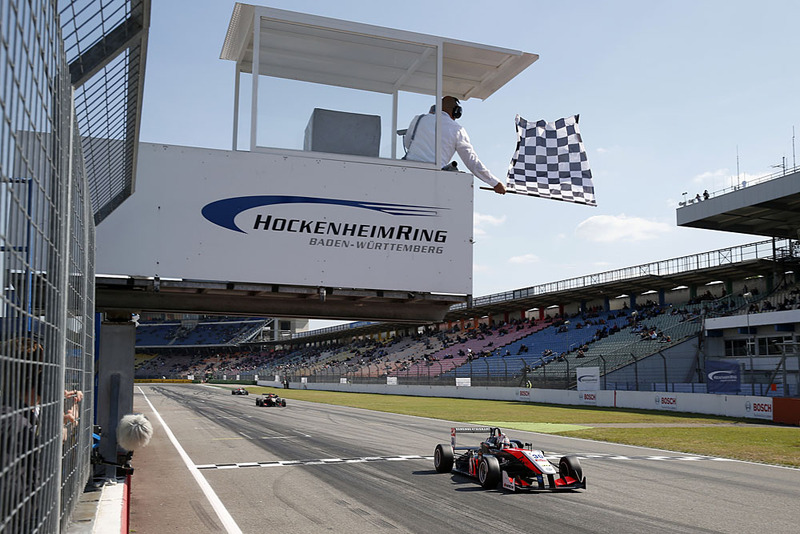 The 16-year-old van Amersfoort racer headed the second all-rookie podium of the season – and of series history – to finish ahead of Prema Powerteam duo Esteban Ocon and Antonio Fuoco. Verstappen rarely appeared troubled during the 22-lap stint. The Dutch racer drove a magnificent opening lap to clear Ocon by 1.5s, as the Prema racer busied himself keeping Felix Rosenqvist at bay. As Ocon solidified his 2nd place, the French teenager closed in on Verstappen by a few tenths, but could do little to pressure the van Amersfoort man. There was an extra opportunity for Ocon however. Halfway around the third lap, the safety car emerged when matting, based on the exit of turn two, had been ripped up by various drivers, proving a possible threat. It mattered little. When the race restarted on lap five, Verstappen pulled some seven-tenths ahead of Ocon, nullifying the Prema man’s chance of reeling in the lead. By the halfway point, Verstappen’s lead had grown to 1.2s and it would rarely extend a tenth further than that, but such are the peculiarities of the Hockenheimring, Ocon could not get close enough to threaten. Come 22 tours, Verstappen crossed the line a winner, with Ocon just 0.8s in arrears. While Ocon attempted to cling to Verstappen, Fuoco shadowed Ocon, but like his teammate ahead, the Ferrari Driver Academy man could do nothing to close in on 2nd place. 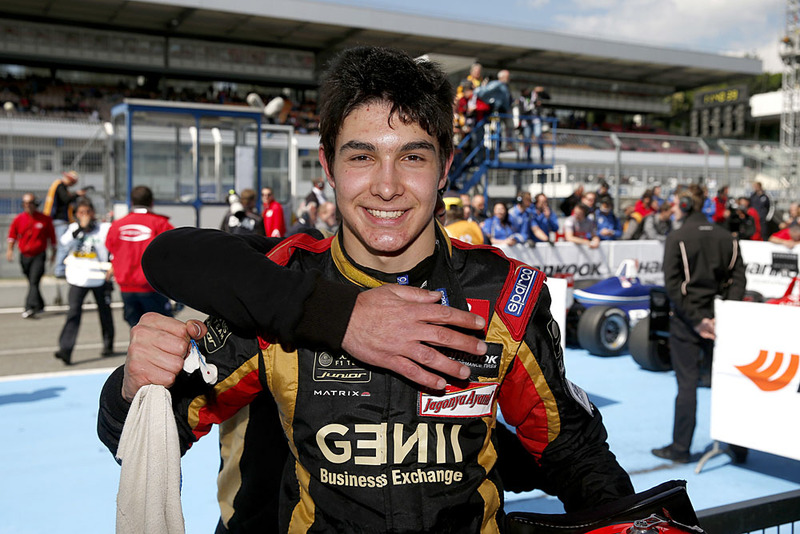 It had been a reasonable race for Fuoco, who had endured a tricky weekend up until the final race. Having started 5th, the Italian blasted past Antonio Giovinazzi (Jagonya Ayam Carlin) on lap 3, before a mechanical problem for Felix Rosenqvist gave Fuoco the podium place. Lucas Auer boosted his early title credentials with a drive to 4th spot following moves on Ed Jones (Carlin) and Giovinazzi. The Italian Giovinazzi held 5th come the flag to add to his earlier podium, while Jake Dennis scored his best position of the season so far with a 6th place (which included a stunning pass around the outside of Jones in turn two). A stunning start by Jordan King saw him jump from 19th to 12th on the opening; however the Briton was greatly helped when he slipped by Sean Geleal, Mitch Gilbert and Nicholas Latifi on the fifth lap. That became 8th when Rosenqvist slipped by the wayside and then 7th when Ed Jones became one of five drivers to receive a drive through penalty for breaching track limits. Roy Nissany, Gustavo Menezes and Riccardo Agostini all picked up their first points of the year when they finished 8th, 9th and 10th respectively – partially because they drove steady races and partially because (like Jones) Mitch Gilbert and Tatiana Calderon picked up drive through penalties for repeatedly going over the track limits. Alexander Toril and Michele Beretta also received drive through penalties for off circuit excursions, while John Bryant-Meisner was given a drive through for taking out Tom Blomqvist and Felix Serralles on the opening lap. With sis of the thirty races in the books, Ocon enjoys a commanding lead of 36 points over Fuoco and Blomqvist, while Auer resides a further four adrift. Verstappen’s win leaves him 5th in the standings, ten points shy of Auer. Ocon leads the standings after round 2. © FIA.